Thank you to Pop Secret for sponsoring today’s post and inspiring me to try building a pillow fort! Winter is in full force. Cold air, winter storms...and snow days!! We just LOVE snow days...but after awhile, we start running ideas to keep us entertained. My little man starts missing outdoor activities and we all start going just a little bit stir crazy! So, what's a mama to do? Last year, my little guy went camping for the first time...and he absolutely loved it! Of course, camping right now would be a recipe for disaster (in the form of frostbite)...so instead, we decided to bring the fun of camping inside! So, what do you need to make the perfect indoor camping fort? Blankets/Pillows/Furniture. Oh sure, you can get all fancy and buy one of those fun kits that have already done the work for you...but there's really no need. Use your imagination and make it your own..get your comfiest blankets and pillows, drape sheets over furniture...use whatever you have! Not only is this a great way to encourage your little ones to use their imaginations...it also doesn't cost a dime! A 'Campfire'. What's a camping trip without a campfire? We many not be able to really bring the fire in (unless you have a fireplace, of course! )...but some old wrapping paper tubes and construction or tissue paper can make it feel like you're in the great outdoors! Really want to get creative? 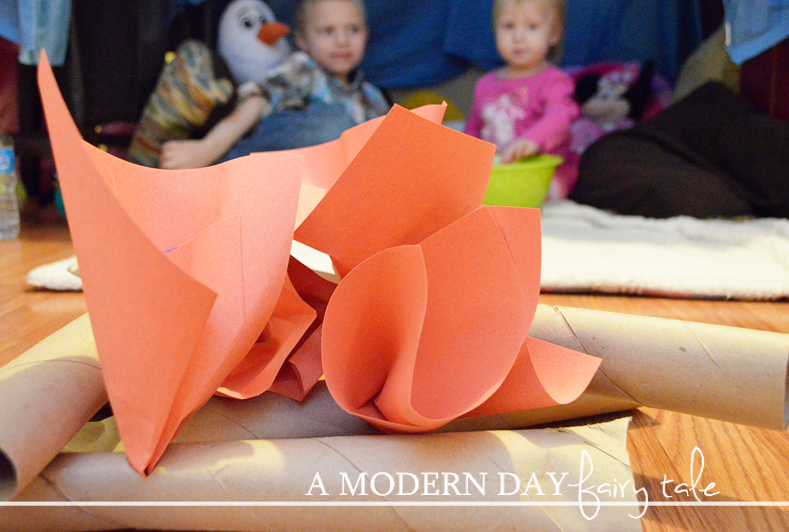 Make trees out of cardboard boxes or construction paper too! Campfire Entertainment. Bring in the fun! Play guitar, play campfire songs? (Don't play guitar...just pretend! Or grab some CDs. Bring in a tablet for a fun filled movie night. Read stories about camping and the great outdoors. The possibilities are endless! The Snacks! Of course, no camping expedition would be complete without fun snacks! 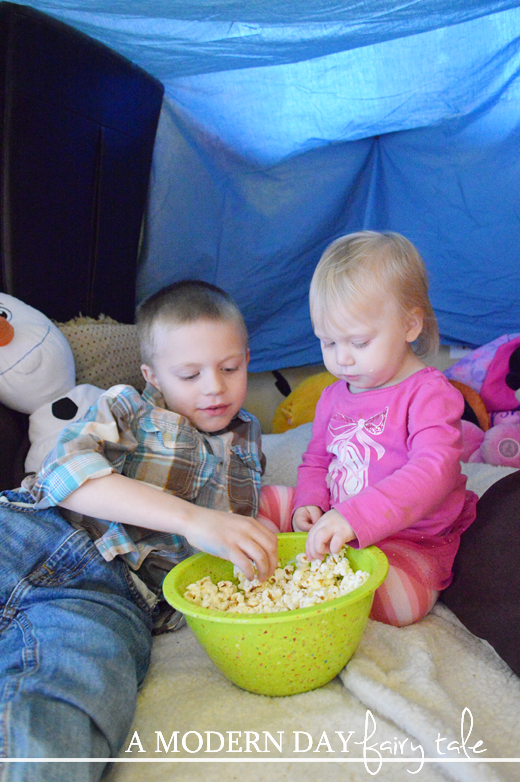 Cooking over the campfire might not be an option, but popcorn is always a must in our home! Keep it plain, add in fun mixings like teddy grahams, marshmallows and chocolate chips (for a popcorn s'mores snack mix) or stay tuned for more fun recipes to REALLY make it exciting! No matter how you serve your popcorn, Pop Secret is sure to satisfy your taste buds! Don't forget the Flag! No fort is complete without a flag to stake your claim! Visit Pop Secret on Facebook and download one of their fun designs...How fun! And the fun doesn't stop there! In addition to the flags,you'll also get some fantastic coupons for $1 off 2 Pop Secret products!! Indoor entertainment your kids will love AND within your budget? You cannot go wrong! 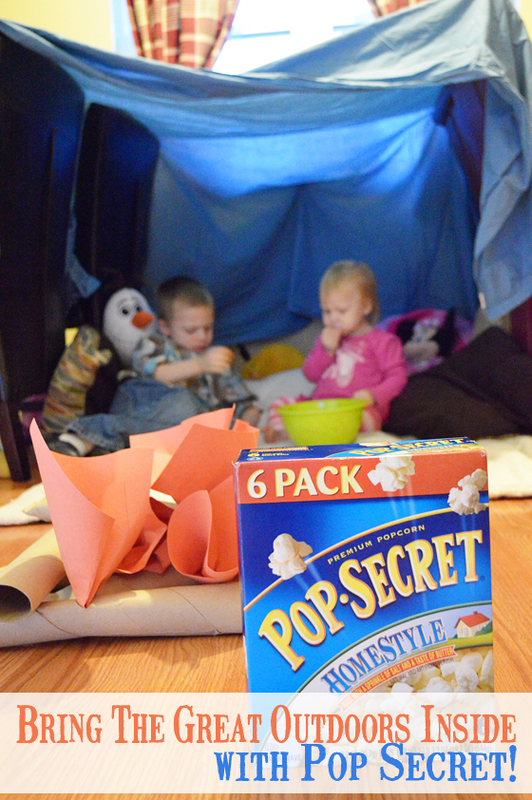 Do you build forts with your little ones? Visit Pop Secret and post your photos and you might just get a surprise pack of popcorn goodness! 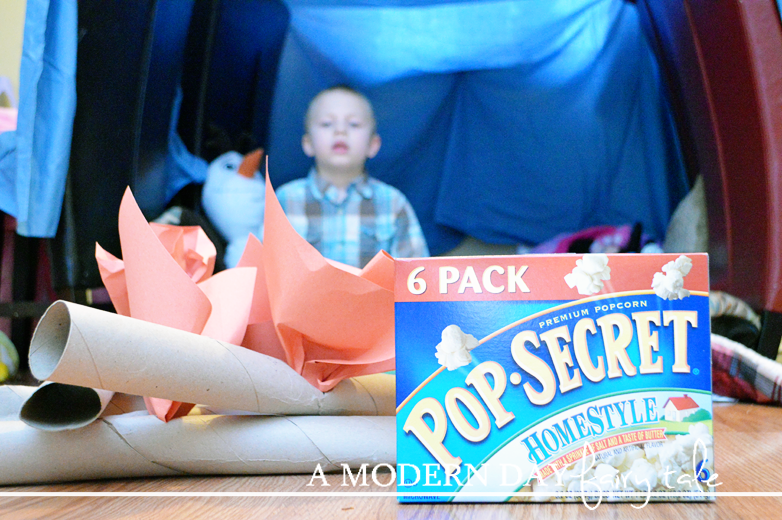 Head on over to Pop Secret for more fort building inspiration now! Are you a master fort builder? What tips do YOU have for the ideal fort building experience? Location, Location, Location! Scouting for the prime real estate is the most important aspect. Make sure the fort is placed in an area with not too much traffic and near an electrical outlet so you can plug in nightlights, fans, charge iPads, wrap the fort with Christmas lights, etc. Our store just started selling those. I think I need to try them with the kids. This is such a cute idea to have an indoor camp fire! :) I love popcorn too! Great ideas, especially as this winter just isn't seeming to end. :) I am not a good fort builder so thanks for the tips!